While essentially the same technique as painting Gold lace using only yellows. Replicating silver can be a bit more daunting because from a distance it looks well, white. The figure at right (Poste Militaire's Officer of Orleans Cavalry) was painted in oils and acrylics but all of the lace both on the figure and the saddle are white and grey. 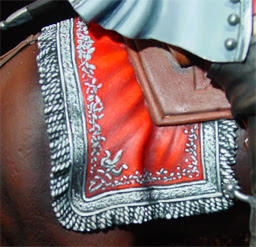 The key difference between painting gold lace using yellows and silver lace using whites is that with silver, the highlights tend to be more extreme. Paint the entire area in a coat of black-grey. 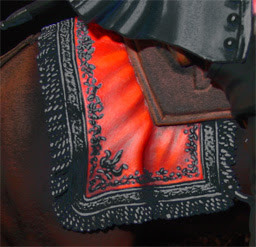 It's important to do this in thin layers vs. thick coats because the last thing you want to do is obscure surface detail-without it, you're stuck. Mix the base coat with a lighter bluish grey. Using that mix, carefully paint all raised detail except that which would not be exposed to light in any way (such as the part of the saddle at right in the shadows). At this stage it is ok to have most of the detail painted in the lighter tone if it is actually exposed to light in any way. Carefully go over all areas that have more exposure to light with a mixture of the second tone and white. (see sidebar on the best way to tell where to apply the paint). At this stage it's starting to look like something. Be careful however at this stage not to over do it. Now for the very highest highlights use a very light grey applying it only to areas that would catch the most light. Again, with silver, unlike god, you will have more areas that reflect light. Look at the arrows at right to see. Using white, touch the tips where the most light would hit-apply only to areas that would capture the most direct light possible. If you compare the two pictures at right you will see that only the very tops of surfaces are affected. Viola! You're done. While time consuming, because you are effectively just layering the paint, it is not as overly complicated as you might think. The most important aspect to understand is the effect and position of the lightsource you are trying to replicate. Without an understanding of that, the whole thing will just blend into itself and will end up looking white. There are actually two ways to practice this technique that might help you learn the effect of light more quickly. One is real easy, simply look at paintings of soldier wearing lace. You'll see that the artist replicates the lace using yellows or whites and grays only yet your eye is fooled into thinking it is actually metallic only because the manipulation of light. The other method is to photograph your figure under a lamp and note carefully where the light hits and where it doesn't. The best thing to do is to prime you figure, place a 100 watt lamp over it (do not use flash) wherever you would like to see the light coming from, and photograph it. You will see EXACTLY where the shadows and highlights are supposed to go. I am trying to improve my painting =amature. I found this posting helpful. Do you have any advice for painting brass band instructments? I have clown band with 13 pieces - how can I findout if there is missing clowns? usually when I paint brass metal I use various ochres, like yellow ochre and yellow ochre light, golden ochre and brown ochre. Try to add minute amounts of orange and even less amount of red. I shade with browns (any brown is ok) and highlight with naples tellow light, and touches of lemon yellow. Sometimes maybe a slightest touch of titanium white only to 1-2 selected spots for ultimate reflection of the metal. What are these clows you have? Flat figures? If so, what editor are from? 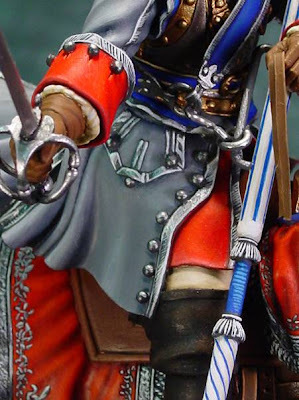 Can you use airbrushes for painting 54mm flats? - with masking? I haven't heard of anyone painting flats with an airbrush so far. Maybe it could be done for large flats but at 54mm I don't know if it is possible. And for sure it's not for the 30mm.